In Records > 78 Records > Show & Tell and Records > Show & Tell. Thomas Alva Edison, born on this day, February 11, 1847 in Milan, Ohio. He was a very inquisitive man and simply put, a genious. He is considered the greatest American inventor. His Menlo Park Laboratory in West Orange, N.J. was a birthing place of many inventions and ideas of which Edison was the 'wizard' of. After improving on the incandescent light, Thomas turned his attention to duplicating sound, and in 1877, while taking a piece of tin foil, wrapping it around a cylinder tube fitted with hill and dale notches for the stylus, he records the first song, 'Mary Had A Little Lamb'. After this achievement, he lets the device lay aside for ten years while channeling his concentration back to even more updates to the electric light bulb. 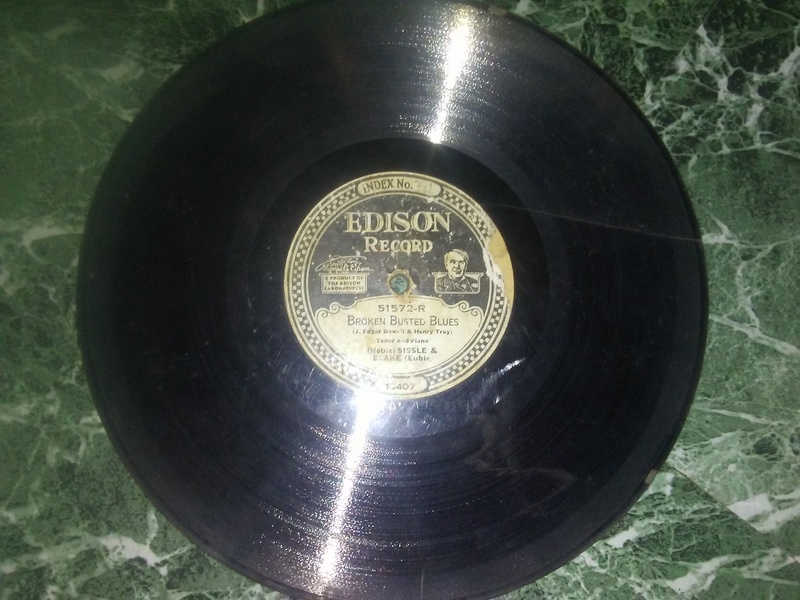 In 1888, he goes back to his device and forms the Edison Gramaphone company and became synonymous with recorded music and speech, all during a time that he was slowly going deaf, yet he did not notice until later in his life. In 1910, he forms the Edison Record Company, producing shellac ten inch discs(Shellac discs were introduced in 1895, only fifteen years before he produces his own). 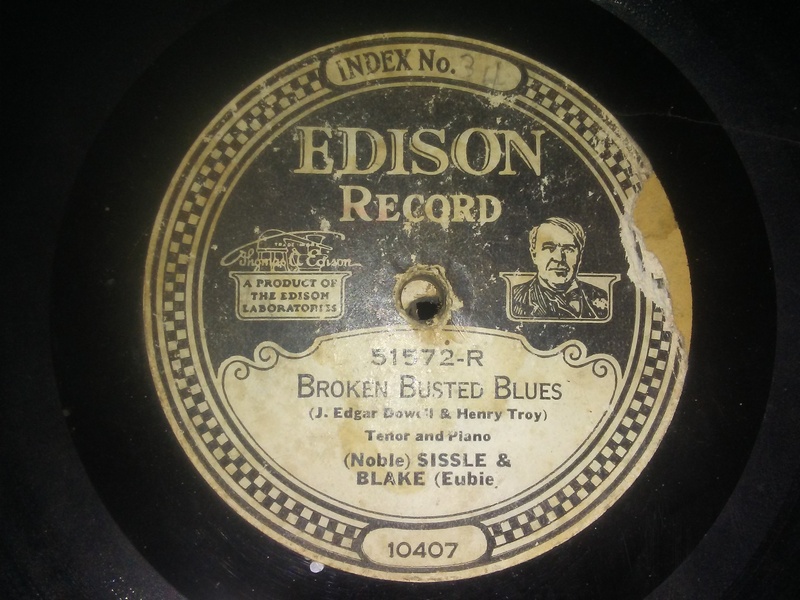 What your looking at is a 1913 Edison disc with a very early recording of a rare song, 'Broken Busted Blue's, written by a Mr. Harold Troy, born in 1879 in Montgomery, Ala.(It was redone later on by Mr. Louie Armstrong). Edison's company produced records for only nineteen years, the last being made in 1929. Two years after the demise of the company, in 1931, Thomas passed away at his home in New Jersey. His good friend Mr. Henry Ford bought the Menlo Park Laboratory and grounds and immediately had it turned into a historical landmark, forever presserving Edison's work. The world of Music owes a debt of gratitude to 'The Wizard Of Menlo Park'!! This disc and a couple of others were acquired by me a few weeks ago through a strictly private transaction. The Library Of Congress in Washington D.C. I have been in touch with and they with me...It is a continuing project. This Disc is 106 years old. This also is a 'Diamond Needle' record. 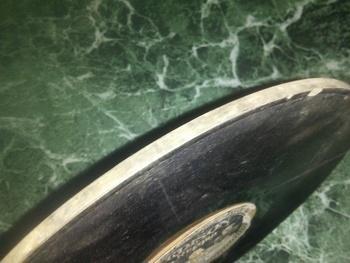 Played only on a player with a fixed in position stylus. FOOTNOTE: It was Alexander Grahm Bell that introduced the 'Gramaphone' , not Edison, until later. Not called 'Record Players' til the 1940s. Great write up!! Thank you. Cool find - have you tried to play it? Thomas thanks so much for this fascinating info on Edison, I only knew about his electricity background not the music, wonderful stuff! Jenni, Your Welcome! He had alot to do with early motion pictures as well. His first invention was when he was young working for a railroad company as a telegraph operator. He improved it. Vetraio, Sinnomore, Sean, Fortapache, Iggy, AnythingObscure, Hunterglee And BB2, Thanks one and all here much!! Allways!! From the "further obscure facts dept. "...Edison's original laboratory in Menlo Park included a small pipe organ. Well now!! Intresting and obscure for sure..Edison had a dear friend in Mr. Ford! Also, Master copies of his recordings were severely damaged in the fire of '14. Officialfuel And PhilDMorris, Thanks you two here much!! Yougottohavestuff And TheGateKeeper, Thanks you 2 here much!! Allways!! Aura, Allways A Pleasure! Thank you here much!! Sean, Thank you again here! TheGateKeeper, Roycroftbooksfromme And Vynil33rpm, Thanks you 3 here much for the appreciation of Mr. Edison!! !